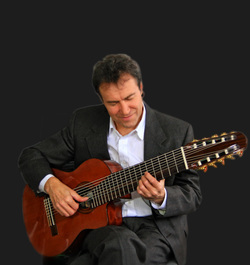 Nikolai Svishev is an accomplished guitarist whose repertoire is based on his love and gift for Spanish guitar, with obvious influences from his passion for Brazilian, Jazz, Gypsy Jazz, and classical guitar. His formal training includes a Masters of Art in Music, with a concentration in Jazz Guitar, and post-graduate studies at the University of South Carolina. As a virtuoso solo artist or as a part of his trio or with an ensemble, Nikolai’s talent has taken him all over the World, with performances in varied venues with some of the most important musicians of our time, including Chet Atkins, Earl Klugh, Larry Carlton, Lee Ritenour, Guinga, and Al Jarreau. SOLO GUITAR Nikolai is available as a solo classical guitarist for concerts, wedding ceremony, wedding receptions and cocktails, as well as a solo jazz guitarist for cocktail parties, private events and corporate functions. Equally conversant with spanish/classical, brazilian guitar repertoire and jazz standards. Nikolai is actively performing in both jazz and classical genres. He is equally versatile with six string and eight string guitars. Nikolai has written musical works for orchestra, voice and various instrumental ensembles, as well as for solo guitar. TRIO PERFORMANCE Nikolai's Trio plays a lovely variety of music by Reinhardt, Antonio Carlos Jobim, and a variety of jazz standards and evergreen melodies from the 30's all the way to modern composers of today. The Trio also is available for classical music. The combination of guitar, violin and upright bass are the perfect combination for a wedding ceremony with a classical repertoire and a beautiful selection of gypsy jazz and brazilian music for the cocktail hour. Venues include concert halls and clubs, from private parties on a riverboat, to a large and prestigious corporate or fundraising event, plus weddings and cocktail receptions. The Trio is in high demand and enjoys much repeat business from satisfied party planners in local Charleston hotels, resorts and reception sites. ENSEMBLE PERFORMANCE An Ensemble consists of Nikolai's Trio and a wonderful female vocalist. Other instruments can also be added such as flute, Latin Percussion and drums, as space and budgets allow. The ensemble features a variety of standards made popular by Frank Sinatra, Etta James, Tony Bennett, Louis Armstrong, Diana Krall and many others. Additional popular American music choices include Cole Porter, Duke Ellington, George Gershwin, Irvin Berlin and more. The ensemble's music is very elegant and danceable, while at the same time the volume is controlled so as not to interfere with normal conversation. From a private party to the large and prestigious social club, the ensemble is very popular choice for wedding receptions and corporate events. The wedding package includes Nikolai playing classical guitar during the ceremony and then the full group plays for the reception.